Yoghurt is no longer spooned out of the pot but drunk. Breakfast is no longer just eaten at the kitchen table but also on the hoof. And it should all be as healthy and sustainable as possible. This is one of the reasons why the demand for smoothies, milk and dairy products is steadily growing. KHS now provides its linear aseptic fillers for the bottling of these sensitive products also as a space-saving block system. 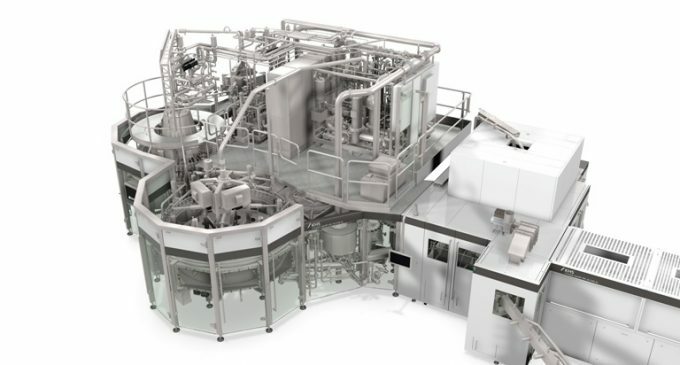 The Dortmund systems supplier is also expanding its portfolio to include a new modular system for filling sensitive products on rotary machines. The systems can all be tailored to suit individual customer requirements and are convincing with their high level of flexibility and microbiological safety. There is a noticeable trend towards foodstuffs which are healthy and sustainable – and for breakfast on the go. Genetically unmodified milk and functional dairy products in unbreakable plastic bottles are becoming ever more popular. With its Innosept Asbofill ABF KHS provides a tried-and-tested linear filling system for the hygienic filling of products such as these. A number of new developments are now making these systems even more powerful. The machine is designed to fill up to 12,000 bottles per hour – or a maximum of 24,000 bottles every sixty minutes on the Twin version – holding between 0.25 and 3.0 liters. “The great strength of this filler lies in its flexibility,” says Thomas Niehr, head of Aseptic Filling Technology at KHS. “The machine consists of a number of different modules and can thus be perfectly adapted to customer specifications.” The modular system permits later retrofits or components to be exchanged which is practical when market requirements change. A new transfer module also enables the Innosept Asbofill ABF to be blocked with a standard stretch blow molder from KHS. Thanks to neck handling, which at the same time gives operators maximum freedom of design regarding the bottle shape, the dimensions of the hygienic or aseptic zone can be kept down to an absolute minimum. Another advantage of the linear system is that it is particularly efficient where there are frequent format changeovers and smaller product batches. It also reliably sterilizes bottles and closures. “The filler can be combined with a screw capper, film/foil sealer, nitrogen application or the new chunk dosing unit as required,” Niehr adds. The KHS dosing module provides bottlers with flexible product design options by adding chunks to the beverage, such as whole cherries, strawberries, vegetables or cereals with a length of up to ten millimeters. Besides the new developments for its linear filler KHS also offers a new modular system for its rotary machines for high-performance filling. The new concept can process between 24,000 and 36,000 and in the future even up to 54,000 bottles per hour depending on the bottler’s required production capacity. The system offers plenty of scope as regards the bottle size, with container volumes ranging from 250 milliliters to 1.5 liters. With the new KHS concept the machines can be adapted in the form of standardized modules for three hygiene categorization classes specified by the German Engineering Association or VDMA. Ultraclean KHS filling machines (UCF) satisfy the requirements of VDMA class III, extended shelf life fillers (ESL) those of class IV and KHS aseptic filling machines those stipulated by VDMA class V. “In the future a KHS filler can be configured depending on which hygiene class a beverage producer’s products fall under and precisely tailored to suit the individual specifications of the customer,” says Niehr.